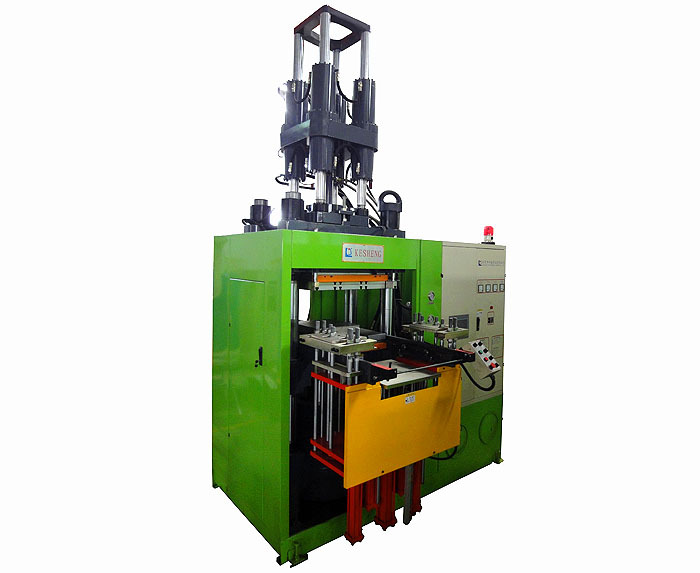 First in first out vertical rubber injection molding machine-High precision automatic injection molding machine-Dongguan City Kesheng Machinery Co., Ltd.
1. Moving vertical injection four-cylinder balanced structure, ultra-stable injection force. 2. Optimized feeding plunger greatly reducing the amount of plastic drain, quick and easy to maintenance and change material. 3. Innovation shoot tube thermostat system plus ultra-short nozzle, to make oddments more less and avoid minimum pressure loss, to meet the requirements of the injection molding process various hardness of rubber. 4. Machine specification under 500 Ton adopt internationally popular First In First Out injection style. 5. Lifting and hanging mode can be mechanical synchronous to the gears, template layers action smooth, repeat high accuracy. 6. Fully enclosed safety bumpers and light shed, a higher level equipment of operational safety . 7. Hot plate heating partitioning control, temperature more uniform. 8. Direct drive variable displacement pump, high efficiency, stable. 9. Larger working platform design. 10. More automation functionality for optional.